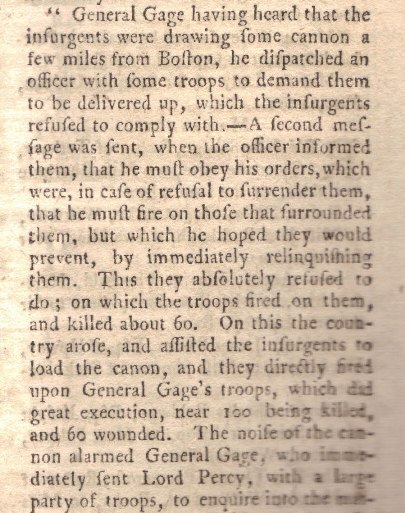 The highlight of this May 1775 issue of Gentleman's Magazine is an amazingly quick account of the April 19, 1775 battle between British troops and American militia at Lexington and Concord, about 15 miles from Boston, Massachusetts. The trade-off with the news reaching across the Atlantic so quickly is that the report is inaccurate and overstates the number of troops killed on both sides. 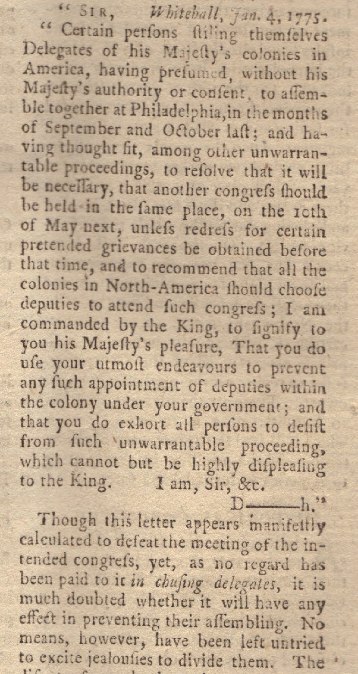 There is much more in this issue concerning the conflict between the British and Americans, including the full text of a letter to royal governors in America instructing them to prevent assemblies from choosing delegates to the Second Continental Congress, with a report on its ineffectual result. The issue also includes an extensive account of the debate in Parliament on a response to King George III's address in which he declared the American colonies "in rebellion" and pledged his wealth and honor to the suppression of the rebellion. Pictured below are some excerpts from his historic issue. Below is some of the preliminary report of the battles of Lexington and Concord. Below is the directive from the British Secretary of State for colonial affairs to American Governor and its impact. In the excerpt below from the Parliamentary debate on the King's address the great orator, thinker and writer Edmund Burke responds to the King's declaration that the American colonies are in rebelliion. 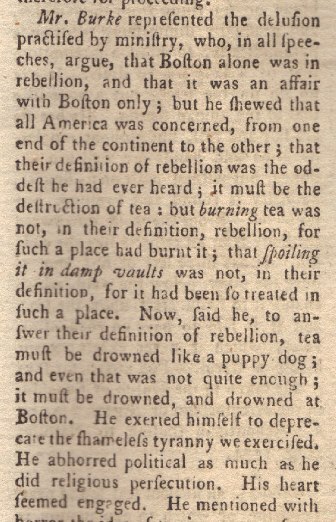 He makes reference to the Boston Tea Party which provoked the severe sanctions of the Boston Port Closure bill and the sending of troops to enforce it that led to the battles of Lexington and Concord. Below is an copper engraved plate included in this issue. 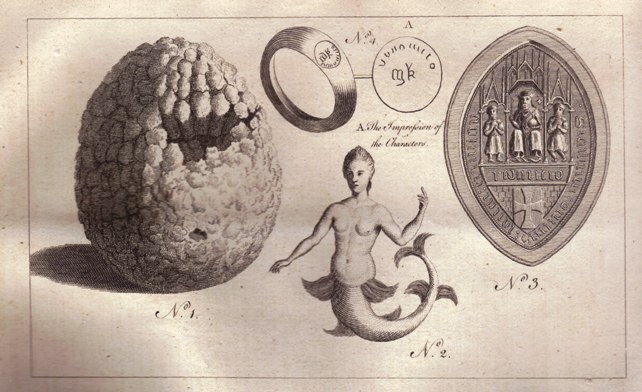 The most intriguing part of the engraving is the picture of a mermaid, which were still believed to exist in 1775. 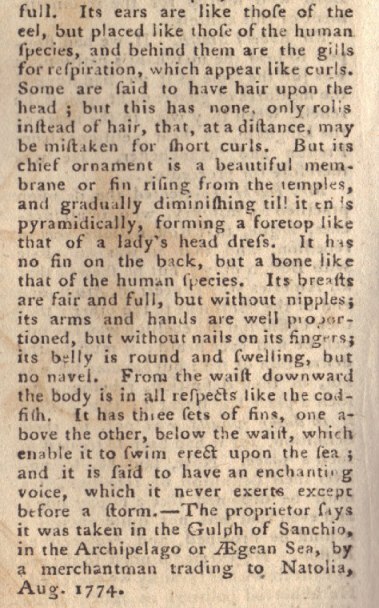 The text that follows includes a description of the mermaid and the location in which it was caught. 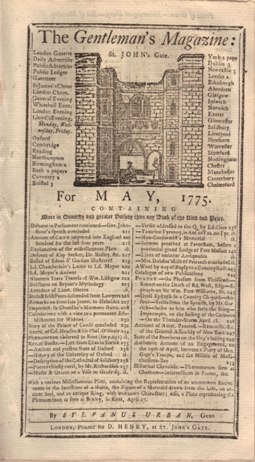 Below is the title page of this issue. Complete issue, disbound, in great condition with both engraved plates as called for. This historic issue records the start of hostilities between Americans and the British that led to further battles, agitation, Revolution and the Declaration of Independence.